1. Cut chilies into rings and pack in a clean 1 quart jar. 2. Bring vinegar, water and all remaining ingredients to a boil in a medium saucepan. 3. Reduce heat and simmer for 5 minutes. Pour hot brine over peppers; seal jar. Let cool, then refrigerate. 4. 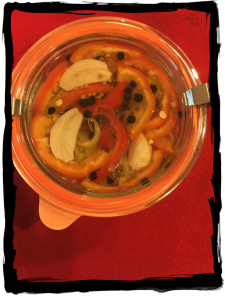 Recipe may be adjusted to suit the amount of peppers you want to preserve.